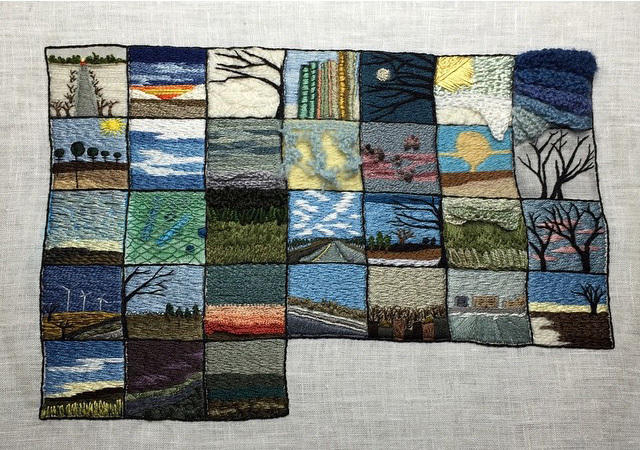 I am fascinated by the daily calendar stitching of fiber artist Lynn Harrigan - known on Flickr as Obliquepoet. 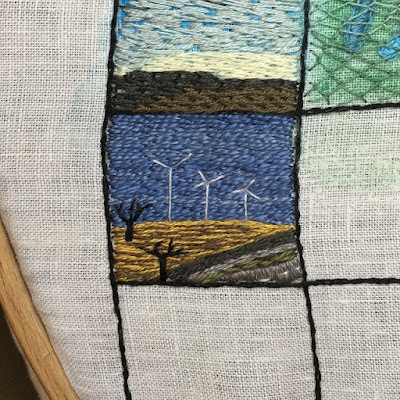 All year, I have seen the loveliest daily stitches of her calendar as it slowly takes shape - and there is something so beautiful in following along with her daily process. 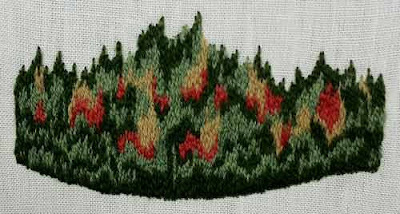 I began embroidering in June 2007 and spent the rest of the summer that year learning stitches and experimenting with the effects of stitching on different kinds of cloth. Later, I took an eco-printing workshop with India Flint and learned some natural dyeing techniques to create interesting grounds for my embroidered images. 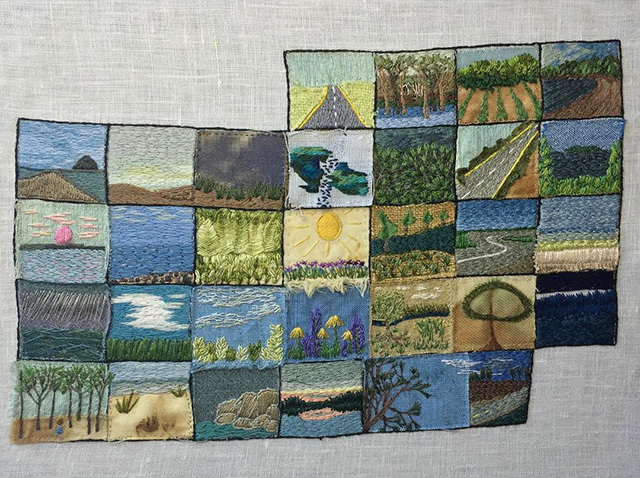 I appreciate a variety of contemporary embroidery styles, from abstract textural work to figurative pieces. I also love the narrative element in the work of embroidery artists Michelle Kingdom and Iviva Olenik. 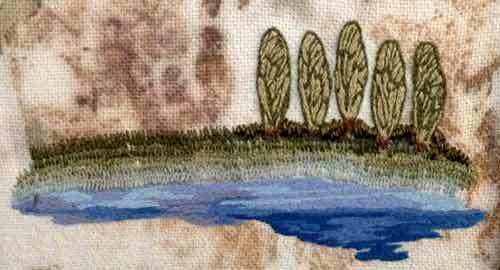 "Cicada Shoreline" from "Aqua Reliquia - Shorelines"
The Great Lakes region inspires most of my embroidery. I was born in Clinton, Ontario and raised on a farm near Lake Huron, one of the Great Lakes. Growing up on the Central Huron coastline and now living in Toronto on the shore of Lake Ontario, the ecology of the Great Lakes region continues to be my main source of inspiration. How much time does it take to complete each square in your calendar? Do you sketch your pieces before you embroider? It takes between 2-4 hours to complete each calendar square, although a few have taken up to 6 hours to complete. Mostly I work from a photograph I've taken that day or a sketch in my journal. "Lake Huron Shoreline" from "Aqua Reliquia - 1913"
You are also a poet and a writer - do you also keep a journal? I use my journal to record the day's weather and sunrise/sunset times as well as to capture and explore ideas for the "Calendar Project". Do you have favorite authors, or writers you feel are significant to you and your work? Alice Munroe's stories are set in Huron County, the area where I grew up. She captures the physical and emotional landscapes of the region with such poignancy. A more direct inspiration is the Group of Seven, especially their paintings of the Georgian Bay area. "Fall Shoreline" from "Aqua Reliquia - Shorelines"
Do you have a studio space or special room you create in? If so (or if not) what would you consider your ideal space for embroidery? 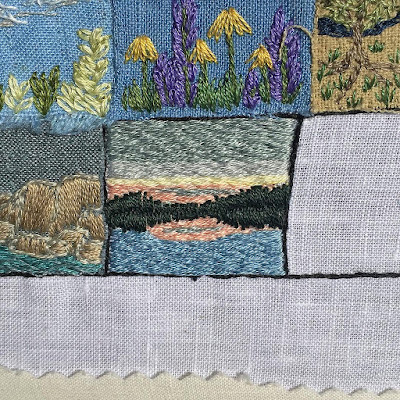 My ideal space for embroidery is sitting outside beside a lake or surrounded by trees, but I most often work at home on the couch with a daylight magnifying lamp. You mentioned a fascinating collaboration between you and your partner, Scott M2 that is a fusion of your embroidery and his music - do you have an example you could share with our readers? Listen to "Indian Summer - 1913"
Do you exhibit or sell your work? I have exhibited and sold a number of pieces over the years. Several of the pieces from Aqua Reliquia - 1913 sold during the show as well as other unrelated pieces exhibited during group shows. More information about the installation, and my other projects, is available at www.lynnharrigan.com. Thank you, Lynn, for sharing your time and talent with us! Follow Lynn's calendar project daily on Instagram and Flickr. 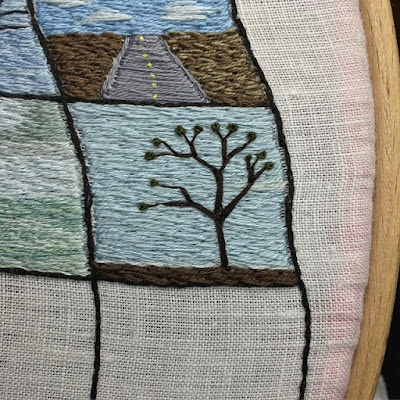 For an in-depth interview on Lynn's process, don't miss the wonderful interview by Olisa Corcoran on MrXStitch - Inspired to Stitch: Lynn Harrigan.